Project team: Bruno Cimmino, Francesco Cristiano, Pasquale Salvatore, Angelo Catani. The new headquarters GMA is a collective project of social and economic improvement, which locates in relations man-man and man-machine the focus of the business, believing that economic competition is practiced also developing work in an environment that pursues participation in choices, concentration, a sense of belonging. The study of production and communication flows, building components, environment geometry and the polisensible size of spaces, was conducted to obtain a work environment that, at all levels, tends to stimulate a psychological climate favorable to physical and cognitive dynamism, prone to a serene and pleased dimension of permanence, that does not lead to loss and dispersion. The company’s mission, as well as on the scale of investment in machinery and organization, relies on well-being in the work space to maximize the contribution of workers and employees in the context of a positive relationship with the surrounding environment is understood as a set of physical elements, psychological and social. 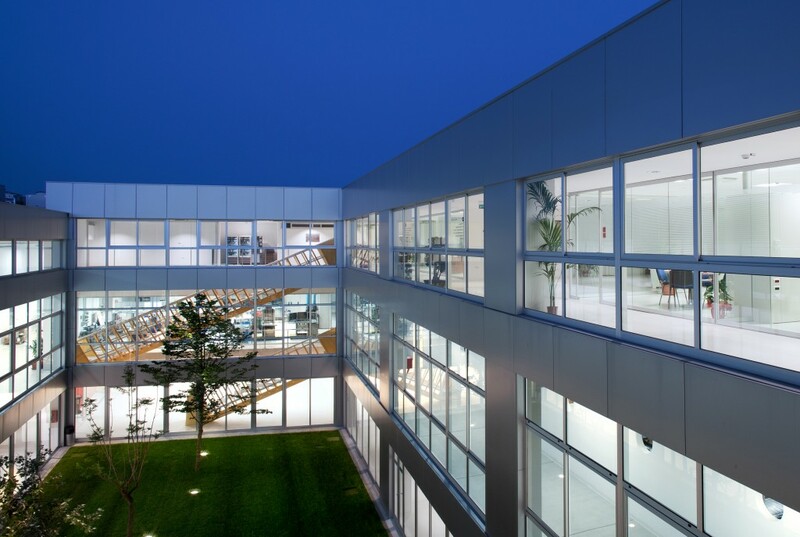 Since the settlement area, despite being an Industrial Development Area, does not excels in environmental characteristics, it was decided to construct a building all facing inward, resulting in a continuous introspection among the departments, a fitting visual filtered by significant natural areas with a rich vegetation. In this way, the physical center of the “factory of artificial” is Nature, changeable and charming, that here is no obstacle to industrial activity, but it is a complement of an artificial landscape, in which one works well and live better, but especially participates in a community of work and intent, in an enclosed space loosely inspired by monastic cloisters. A substantial part of the project is about reaching out to the following purposes: using systems for energy efficiency of artificial air conditioning systems, by the proper sun exposure and mitigation of summer irradiation negative effects; maximize the thickness of the building components to reduce thermal transmission and increase the thermal inertia; employ the vegetative component for correcting climatic environments. Starting from the knowledge of the Bioclimatic applied to the workplace has been designed a plant that surrounds a large Garden (“Impossible” because they do not normally do). Trees and shrubs in the heart of the industrial production mitigate the stress of artificial light and natural vegetation. Even at the floor of the offices are arranged three concentrations of plants that create fireplaces of natural light. In the great cloister (Impossible Garden) 4 trees are located on the best suited side to shade the Cafeteria, Conference Hall and the electronics department, chosen appropriately: a Linden for the typical summer scent, a Jacaranda to color space of indigo, two Poplar trees to shade effectively immediately. In smaller patios at ground floor there are two agricultural issues typical of the area.